It is a roughly one mile walk on a beautifully maintained winding path through the Wellington Environmental Preserve out to a lone standing structure. I reach the bottom and begin to climb. Sixty steps and six stories later I am at the highest level of an observation tower, giving me a magnificent view of the 365 acre facility, surrounding Palm Beach County and the edge of the Everglades. 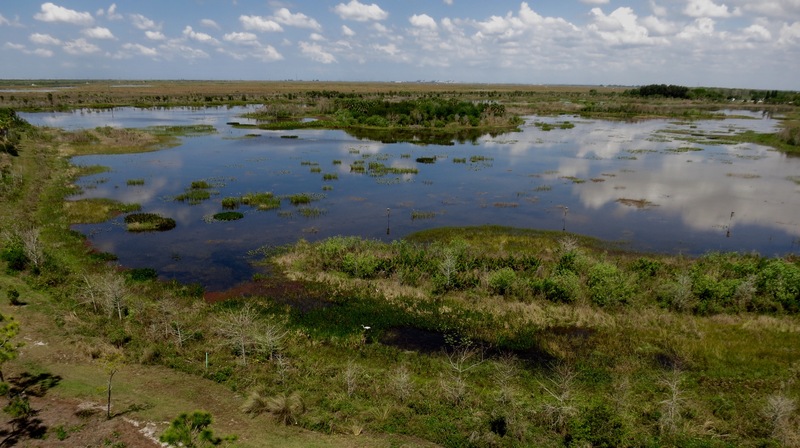 The city of Wellington in partnership with the South Florida Water Management District, built the facility in compliance with the 1994 Everglades Forever Act, which requires rainwater to be cleansed of phosphorus before it enters the Everglades. The first thing I notice as I step on the top platform is that it is necessary to sidestep some orange, fruity, pulpy mess. Someone or something or some bird seems to have regurgitated a large amount of fruit. And while it is colorful it’s a reminder that not all that is observed is necessarily beautiful. I set my small pack down on the opposite side of the platform, swill some icy water and begin to think about which direction I should look. The view is expansive, and bird life is abundant in the Preserve. Less than 100 yards from the southwest corner of the tower I see an alligator in the water! 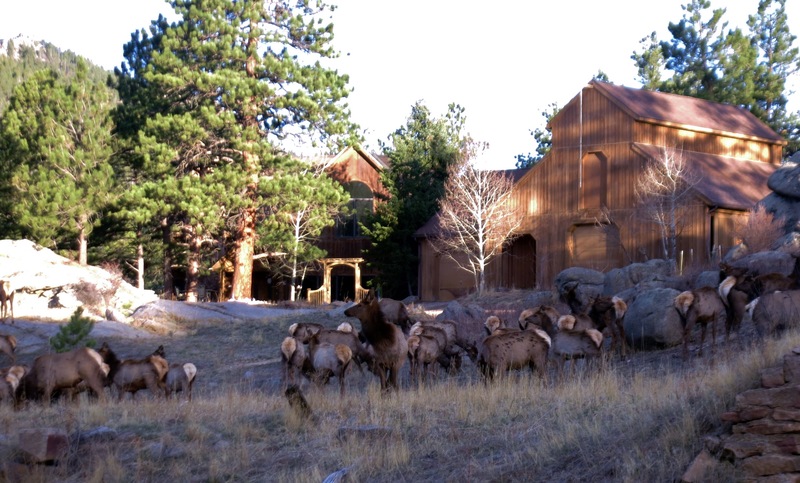 For locals this would be no big deal, but for a Coloradoan it is exciting. In shallow water he moves deliberately, churning up mud in his wake. He continues to snake his way in a southerly direction, then east. I’m reminded of any number of Disney movies, any one of sinister characters that create havoc on the peaceful creatures that live in the Preserve. He winds and wends his way around grassy sections in the water slowly moving toward two American Coots that are paddling about. As he gains on them he then stops, slowly sinking lower in the water, just his long nose above the surface. The Coots are on to his game and don’t take flight but stay a safe distance, ten yards ahead. He is looking right at the closer of the two. But there is a violent splash to the gator’s right as a fish breaks out of the water. 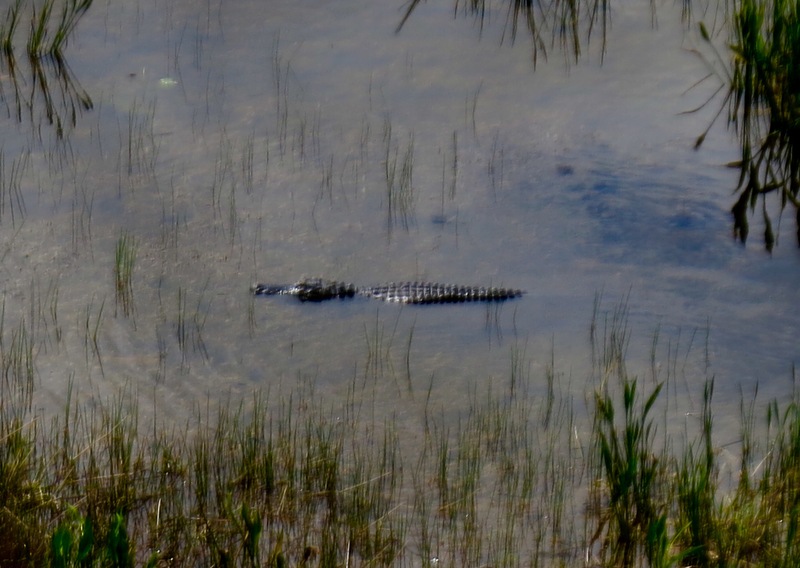 The alligator immediately turns 90 degrees to his right swims a few yards and stops. The drama is over, the Coots move on, Mr. Gator is left to bask in the sun. I move to the opposite side of the tower and look north. Birds and calls of birds dominate the scene. I watch a Great Egret make its way through the water, looking and fishing. Over the course of the hour I remark how the Egrets light upon vegetation in the swampy area, seeming as though they would rather not get their feet wet. I move from side to side of the tower taking in the view, the beautiful day, the serenity of this area. To the west I notice a wake and see a second alligator moving through the waters. Over the course of the hour I see a smaller third gator and notice that the two larger ones cover a lot of area in the water and are very active, a remarkable difference in predator versus prey contrary to my previous week’s observations. An osprey flys by at one point. Red winged blackbirds chime relentlessly overshadowing the softer coo of doves that are in the area. I spy a great blue heron off to the east, standing vigilant and at attention. To the north, I can see a woodpecker with a red spot on his head clinging to a bird box. Without my binoculars I cannot positively identify him. Also north, I seen a couple of common moorhens gliding in the water. Blue jays fly by and the area is also abundant with boat tailed grackles. Further out in the water I see a limpkin and have decided that on this trip, the limpkin is my favorite bird. Over the past days there has been one sitting in a tree where I have been fishing at a canal. In the 1800’s European settlers found them so tame they supposedly could sometimes catch them in their nest. At one point I am joined by a gentleman who has climbed the tower while his wife waits for him below, choosing not to ascend higher on this warm day. He tells me that on the walk in, of which he took a different route than I, they saw two juvenile alligators by the one catwalk. He tells me they still had their “stripes” indicating their age. Seeing I have a pad in my hand he asks if I am a researcher. I explain that no, I’m merely an observer of what is going on around me at the moment. The hour comes full circle, the sun warming the day and high clouds creating enough of an effect so as to make it “not as hot”, but not really cool. The humidity of the area is refreshing compared to the 16% relative humidity Colorado has been experiencing in previous weeks. I make my way back down the steps of the high tower, a sentinel overseeing this edge of the Florida Everglades. I’m finding that a key to keeping this project going on a weekly basis is flexibility. I had planned on one location yesterday and my schedule didn’t allow for it. This morning I awake and as I let the dogs out in the still dark morning I see large raindrops on the back porch. Back to the proverbial drawing board. Later in the day, without a car, I saddle up my mountain bike, grab one of my two dogs and we slowly make our way north 1.7 miles to the local dog park, my place to sit and observe for one hour. I want to sit in various public places and while it is still fairly cool today, I feel there will be some good activity at the newly redesigned dog park. Joining me is my 6 ½-year-old spaniel/hound mix Coada (pronounced Kwah’-duh). Leaving behind my older dog Izy is a difficult choice but she doesn’t do well with hard running anymore so I sadly leave her at the house as we head out. I find a bench, sort out my things and encourage my pup to go play. The initial ratio of dogs to people is 2:1, with about eight dogs running about. I tune in to some crows cawing and prairie dogs chirping in the background. But the main focus of my attention is confined within the fence of this park. The energy early on is building as a dog comes flying in front of Coada and me. Only after he passes do I notice that while he has front wheel drive intact he only has one leg driving in back. He moves so fast that it is easy to miss that he is only three-legged and he doesn’t seem to care one bit. Eight minutes into our watch Coada lies down in the gravel by the bench. He is hyper alert and can’t sit still for long. Yet, he does not engage with the other dogs and begins his barking and howling, mainly at me, but sometimes at dogs that come close to us. An adorable four month old Norwegian Elkhound saunters underneath my bench. His fur is soft and clean, and as I stroke him he caves in to my touch, clamoring for more. Coada jealously nudges him out of the way. The mood of the park is of general good fun, people converse, the dogs breaking down the social barriers, as folks inquire about names, ages and such. I note what I hear for a few minutes. It’s banter that you would only hear if you were at a dog park or a day care center. At 30 minutes Coada has become territorial, guarding the 20 yard radius of the bench upon where I sit. He is barking more than not and basically being anti-social. I break my rule of sitting in one spot and we head about for a walk of the space. He seems a bit out of sorts without his good friend, Izy, as they are rarely separated. As we walk he does not leave my side and I have to encourage him to engage with the other dogs, but he really doesn’t want to and when he does he runs at one or a few, begins to howl and then runs back to me. He is the loudest dog in the park. A gentleman with a black labrador remarks that if a dog can’t bark at a dog park, well, where can he bark? There are easily now twice as many dogs as when I arrived and the energy is very high. Dog parks are mainly about posturing among the canines. If the “babysitting adults” were not in the way they would probably have an even greater time amongst themselves. Back at the bench I notice an “outsider” walking on the outside with her human. She looks in at the dogs but is more interested in the prairie dogs that scamper about outside the chain link fence. Our little area is also very popular because I have a small water bowl that most of the dogs with long snouts drink out of. Those with broad snouts are out of luck because they can’t force the fold of the flexible bowl open in order to get at the liquid relief. Many of the dogs come running as I take photos with the camera, seemingly hamming it up but instead are fooled because they think I have treats, especially when my hands goes in and out of my pocket. The regulars know how to work it, they were not born yesterday. As I near the very end of the hour the whole mood has changed and somehow nearly all of the dogs have disappeared. There remain just two pointers running about that have Coada’s attention as he makes a run at one of them only to come bounding back to me. We pack up our things and make our way back to my bicycle for the slow ride home. It was good to bring a fine friend along for my venture. He’ll earn an extra scoop of kibble for his help today once we arrive home!